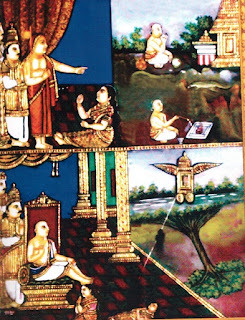 In the previous article (http://ponnadi.blogspot.in/2012/12/charamopaya-nirnayam-ramanujars-acharyas.html) we have seen how emperumAnAr's AchAryas established his uththArakathvam. Now, we will continue on with the next section where many great personalities reveal emperumAnAr's avathAra rahasyam. 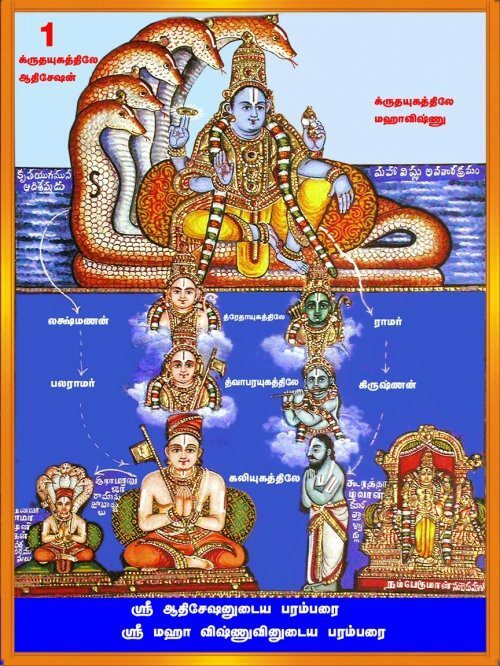 sarvEshvaran in his krishNAvathAram, through arjunan's bewilderment, revealed charamaslOkam which establishes prathamOpAyam (i.e, emperumAn is the upAyam); Likewise, emperumAnAr who is an avathAra visEsham (special incarnation) establishes charamOpAyam (i.e., AchAryan is the upAyam) on himself. Let us see how. During his stay with all his sishyas in thirunArAyaNapuram, once mudhaliANdAn was reciting yAdhavagiri mAhAthmyam (a portion of nAradhIya purANam which brings out the glories of thirunArAyaNapuram which is known as yAdhavagiri due to the fact that balarAman and kaNNan emperumAn worshipped the emperumAn there in dhvApara yugam) in front of emperumAnAr and his gOshti. The following slOkam which glorifies AdhisEshan is recited at that time. ananthan (AdhisEshan) is the first incarnation serving emperumAn in paramapadham, kshIrAbdhi, etc; his second incarnation is lakshmaNan to serve srIrAman; his third incarnation is balarAman to serve kaNNan emperumAn; his fourth incarnation will be in kali yugam as a great personality to reform the whole world. When the sishyas ask ANdAn who is that great personality to appear in kali yugam, ANdAn looks at udayavar's beautiful face. udayavar tells him that the rishi said this keeping AzhwAr in his mind. Understanding that the gOshti is not fully satisfied, udayavar instructs ANdAn to simply repeat that for now and we can see further meanings later. ANdAn also completes the recital for then. In the night after every one left, ANdAn, embAr, thirunArayaNapurathu arayar, mAruthi ANdAn and ukkalammAL goes to udayavar, offer their sAshtAnga praNamams to him and requests him to reveal the real meaning of bhavishyadhAchAryan identified by the rishi. He says "If you insist, I will tell you. But dont reveal this to anyone since it is very difficult to develop nishtai on this matter (charamOpAyam). I am the bhavishyadhAchAryan; I have appeared to uplift every one who has the desire to serve emperumAn. So just fully depend on me, you have nothing to worry about". This information is very confidential. Many revealed that udayavar is a special incarnation. Once during adhyayana uthsavam at thirumAlirunchOlai azhagar sannidhi, in the assembly, azhagar emperumAn says "NammirAmANuchamudaiyArkku aruLappAdu" (நம்மிராமாநுசமுடையார்க்கு அருளப்பாடு) meaning "I am inviting the followers of my dear rAmAnujar". All the srivaishnavas come forward and say "NAyiNthE" (a term which is commonly used to identify that we are a completely surrendered servant). A few descendants of periya nambi stay behind and not come forward and emperumAn asks them why are they not coming forward when he invites them? They reply that "since you invited the followers of rAmAnujar and since he is a disciple for our family which means he is subservient to us, we did not come forward". For that azhagar emperumAn says "Your act of considering my dear rAmAnuja as your sishya is just like dhasarathan, vasudhEvan, etc considering srI rAman, krishNan, etc as simply their sons. rAmAnuja is the leader of my servitors. If you give up his leadership how are you going to be uplifted?". Another time, azhagar emperumAn invites kidAmbi AchAn (a dear sishya of emperumAnAr) and asks him to sing a pAsuram in front of him. He passionately sings ALavandhAr's sthOthra rathnam 22nd slOkam in front of emperumAn. I am not fixated on karma yOgam; I am not self-realised (not fixated on jnAna jOgam); I dont have bhakthi towards your lotus feet; I have nothing in me to attain you; I dont have any other refuge; Oh the refuge for every one! I am surrendering unto your lotus feet. Hearing this azhagar emperumAn tells him "How can you says you have no refuge when you are surrendered to rAmAnuja?" meaning "The ones who have taken shelter of rAmAnuja who can be approached by every one and who is the uplifter of everyone should feel very secured about attaining the ultimate goal and not be in any anxiety". Thus, through these 2 incidents, azhagar emperumAn brings out the divine glories of emperumAnAr. In perumAL kOil (kAnchipuram), a vaishNava begets a son who stays dumb until the age of 6. After that that child suddenly disappeared for a couple of years and returned after some time with the ability to speak to the amazement of everyone. Everyone asks him where has he been and he replies that he had been to kshIrAbdhi. They ask what is the news there. He replies that the residents of kshIrAbdhi are discussing that kshIrAbdhi nAthan has instructed sEnai mudhaliAr to appear in the bhUlOkam to reform the suffering jIvAthmAs and make them my devotees. And per that order, sEnai mudhaliAr appeared as iLayAzhwAr for the benefit of everyone. After revealing this the child immediately disappeared and never to be seen. Thus, kshIrAbdhi nAthan through this child revealed the greatness of emperumAnAr. When udayavar was learning sAmAnya sAsthram from yAdhava prakAsan, the daughter of the local king becomes possessed by a brahma rakshas (a brAmaNa due to his faulty anushtAnams taking birth as a rAkshas in the subsequent birth is called brahma rakshas). The king invites yAdhava prakAsan to his palace and requests him to cure his daughter. yAdhava prakAsan along with iLayAzhwAr and other disciples goes to palace, recites many manthrams to drive the brahma rakshas out of the princess. Hearing that the brahma rakshas says sarcastically "I am not scared of you and I wont leave the princess if you ask me to do so". yAdhava prakAsan asks "Who needs to tell you to go?" and the brahma rakshas, pointing to iLayAzhwAr, replies "In your students, there is one who is the leader of the nithyasUris and one amongst ananthan, garudan, vishwaksEnar, etc. If he orders me to go, I will fall at his lotus feet and leave." and subsequently does so. Thus the brahma rakshas revealed that udayavar is a special incarnation. When udayavar goes to sAradhA pItam (kashmir), sarasvathi happily invites emperumAnAr saying "He is definitely an amsAvathAram of sarvEshvaran" and with great affection requests emperumAnAr to explain the chAndhOgya upanishadh vAkyam "kapyAsam punNdarIkamEvamakshinNI" (கப்யாஸம் புண்டரீகமேவமக்ஷிணீ) and udayavar explains that "srIman nArAyaNan's divine eyes look like just bloomed red lotus flower". 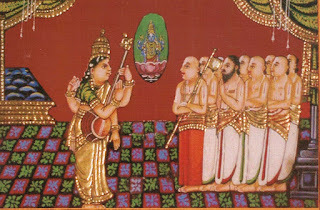 Hearing that sarasvathi becomes very pleased and shows her gratitude by telling him "You being an avathAra visEsham, out of your limitless grace have taken up this long journey to bless me" and holds srIbhAshyam, etc., on her head with reverence and gives him the name "srI bhAshyakArar". 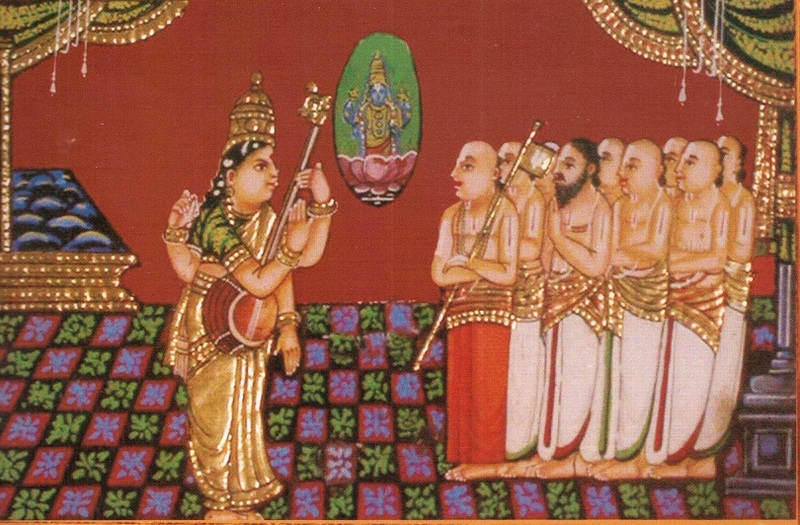 Thus sarasvathi reveals emperumAnAr's avathAra rahasyam. In the next section, we will see the glories of emperumAnAr as revealed by many great personalities.